Anytime I share a new zucchini recipe with you guys, I like to share a quick story of how the recipe came about. Like my zucchini bread muffins with apples and carrots. I made these because I was trying to sneak more vegetables into my kids (and husband’s) breakfasts. And the single-serving death by chocolate zucchini mug cake is because I desperately wanted something rich and decadent, but didn’t want to heat up the kitchen. Well my story for these butter parmesan zoodles is very straightforward: I made them and they rocked. The end. Ok, so there’s just a little bit more to the story. Mr. Crumbs and I are going on vacation this summer and we’re doing the traditional “be good now so you can be bad later” routine. 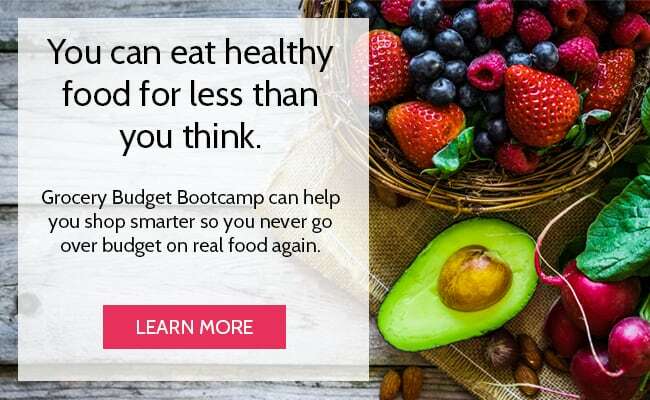 So in general, we’re trying to eat more good stuff and less bad stuff. 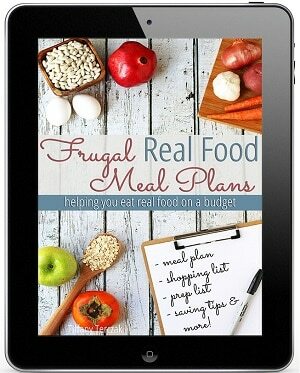 At meal times and in real life, it means eating more vegetables. A couple years ago, my aunt found a killer deal on this spiralizer and sent it to me as a gift. Now that we’re trying to swap veggies for pasta, I’m using this thing ALL THE TIME. My first experiment was zoodles with my homemade hearty spaghetti sauce. It was good, but it really felt like I ate a bowl of sauce with zoodles on the side. I think next time I’ll try my lighter, 15-minute spaghetti sauce instead. A couple days later I was cooking dinner and I didn’t have enough zucchini to make a full entrée. 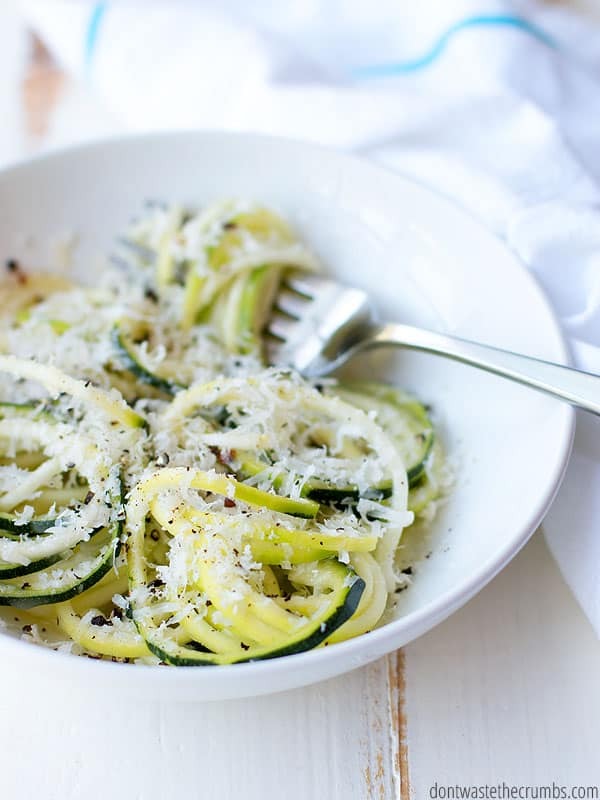 I ended up spiralizing the zucchini I had for a side dish and simply added butter, Parmesan cheese, salt and pepper. My dad was visiting, and he doesn’t like zucchini, so the fact that I only had enough for Mike and myself wasn’t a big deal. Until my dad tried it, liked it, and finished it off! I’ll admit – this recipe is incredibly easy, much like 90 Minute Man Bread and 15 Minute Alfredo Sauce. All of these recipes are so simple, yet very, very good. I’m all about simple when it comes to getting dinner on the table. Especially on busy nights! 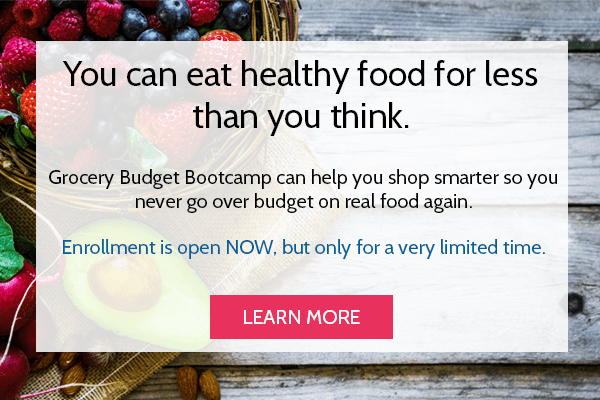 I share my simple meal planning method in Grocery Budget Bootcamp, an ecourse designed to help you feed your family real food on a budget! In the case of today’s zoodles, there are a few tricks to help you get the texture of zucchini noodles just right, that way you end up with a dish that resembles pasta. Zoodles you can twirl your fork in and soak up the butter and cheesey goodness. Not just a pile of zucchini noodle slop. Let’s not do zoodle slop, mkay? Now, I’m fairly new to the spiralizer craze as a whole, so I had to do some digging on how to cook the darn things… or if you even have to cook them at all. This post had great tips on the different ways to make and cook zucchini noodles, and there are some more zoodle cooking ideas in this post too. 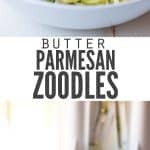 For this recipe, I decided to leave the zoodles raw. 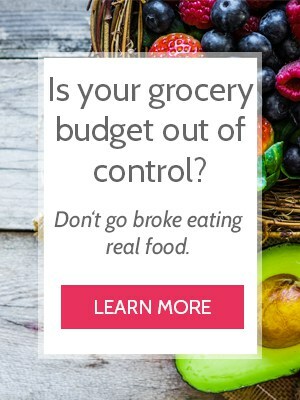 I already know that as summer approaches, I’m not going to want to cook. No boiling water. No turning on the stove. No heated nothing. They don’t call this town Hotlanta for nothing, so anything I can do to keep the kitchen cool is what’s for dinner. I figure why not get a head start? #1 – Start with room temperature butter and zoodles. You’re going to melt the butter, but melted butter is hot. If you keep your zucchini the fridge, it’s going to be cold when you spiralize it. Hot butter + cold zucchini = zoodles with chunks of butter, and it’s not exactly pretty. It’s good, if you don’t mind eating small chunks of butter with your zoodles, but it’s not exactly award winning. However, if you let the butter cool slightly, and bring the zucchini out to room temperature, you get a bowl of deliciousness for dinner. Highly recommend. #2 – Removing the excess water from the zucchini. Zucchini contains A LOT of water, so after you’ve spiralized the zucchini, spread it out on a towel. Cover it with a second towel, gently roll it all up together and let the zucchini sit for about 10 minutes. The towels will absorb the excess liquid, and you’ll get perfectly plump zoodles for your recipe! Note that you COULD skip this step, but the zoodles will inevitably leak the water and it could ruin your sauce. I don’t recommend. This dish is best when served immediately. 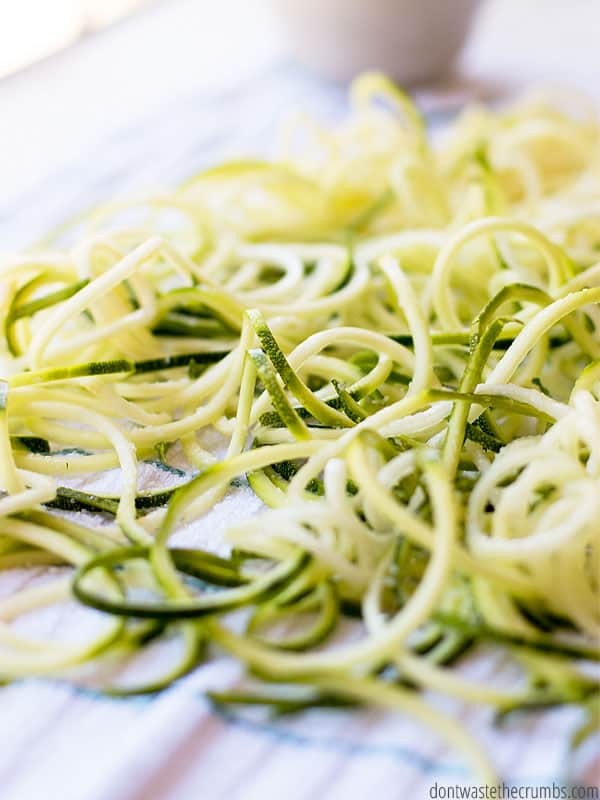 If you want to get ahead, you can spiralize the zucchini, remove the excess water and store it in the fridge. Just don’t forget to bring it to room temp before you add the butter and Parmesan! 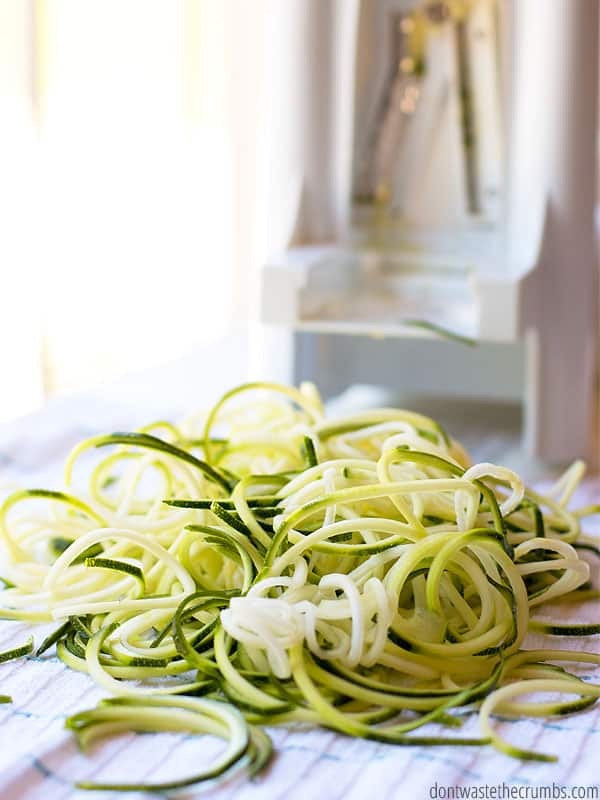 I use this spiralizer to make my zoodles. But a julienne peeler works too if you don’t have space for a spiralizer. Using a nifty butter crock like this one means you can keep your butter at room temp. 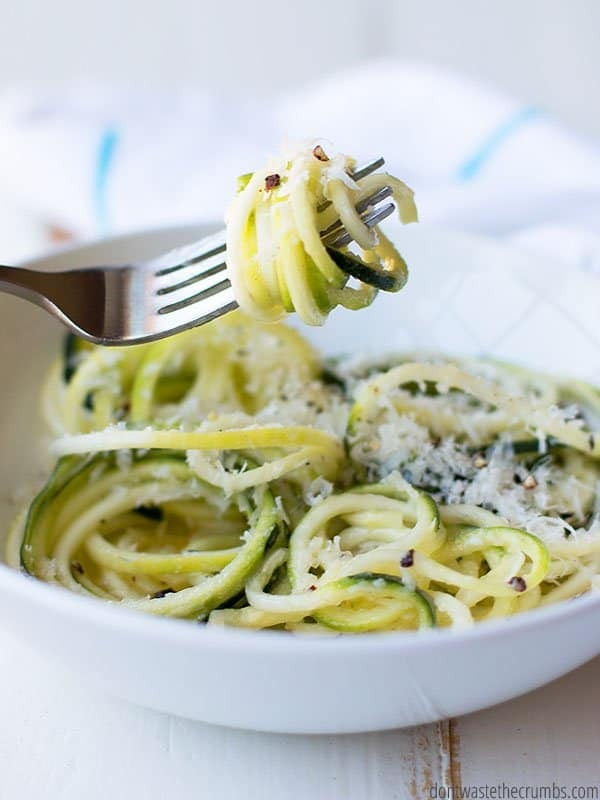 Perfect for butter parmesan zoodles or slathering on a fresh slice of baked bread! 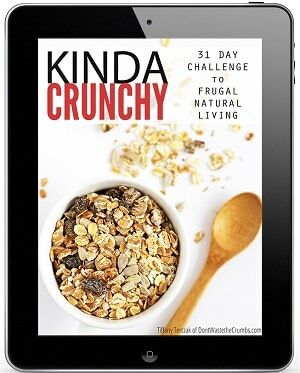 This recipe is featured in my One Week No-Cook Meal Plan! Perfect for hot summers when you don’t want to heat up the house! Spread the zucchini on a kitchen towel and cover with a second towel. Roll up gently from the end and allow the zucchini to sit for 10 minutes. Unroll the zucchini and place in a bowl. Add the cooled, melted butter and Parmesan. Season with salt and pepper! 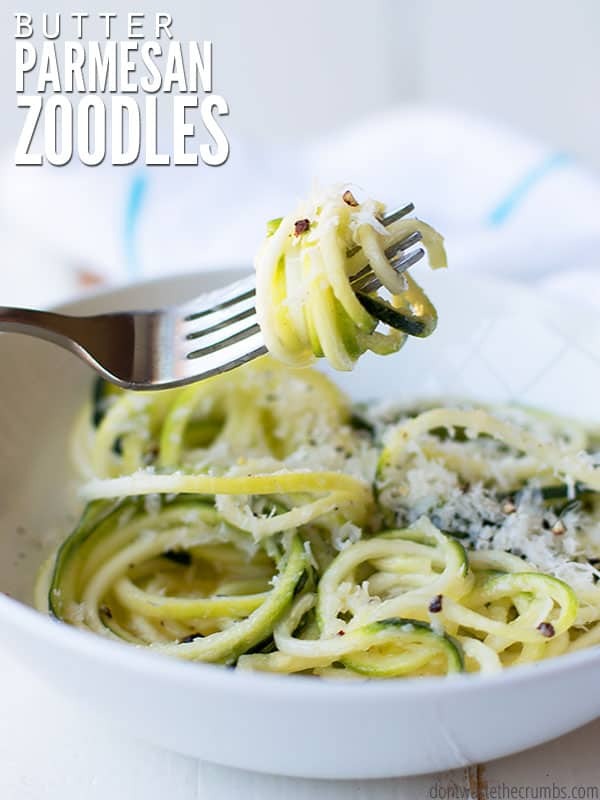 Are you a fan of zoodles? Do you have any tips for making them or enjoying them with sauces? My toddler will love this! Could you email my husband and tell him this is an essential need and not a want?! Haha Thank you for the recipe! Really?! That’s so awesome! It was a shot in the dark on my end, lol. So glad it worked!! My family hates zucchini, but they LOVE zoodles. Great recipe Tiffany!!! 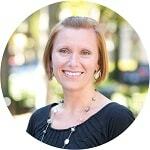 I don’t Patrinka, but you’re welcome to input the ingredients into any nutritional calculator online! I love zoodles! I think half of my pinterest recipes are zoodle based. My favorite simple boom-done zoodle recipe though? Spiralize them, saute them up in a leeetle bit of olive oil, a little bit of sesame oil (combined total of a “normal” amount of oil needed, with slightly more sesame than olive). Toss with soy sauce (or coconut aminos, if you’re trying to cut down the soy) and sesame seeds. Serve with grilled chicken and YUM. 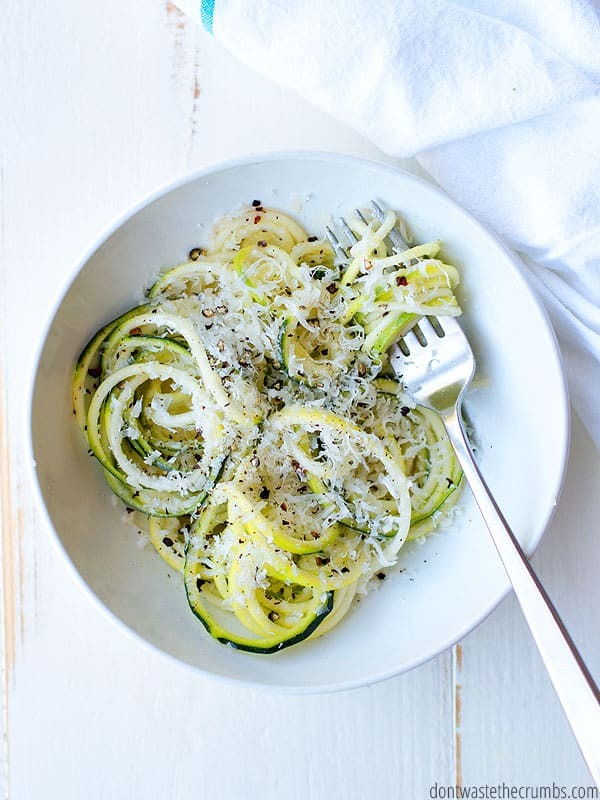 How do you spiralize the zucchini . Which is the best instrument to buy.